My father in law bought this book and figured I might want to read it. 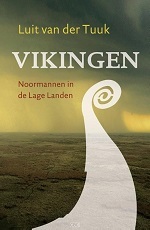 “Vikingen, Noormannen in de Lage Landen” (‘Vikings, Normans in the Low Countries’) is a revised and expanded version of the same book that the author published in 2008. Van der Tuuk is conservator in the Dorestad museum (and in that capacity I once had a guided tour from him). Dorestad was the most famous Dutch trading town that was sacked and burned down by Viking raiders several times. It is exactly the image of ravaging barbarians that the author aims to revise. Most information we have about the period of the Viking raids comes from Christian authors who depicted the situation worse than it actually was. Of course they also benefited from depicting the heathens as barbarians. The book is an enormous summing up of historical events which Van der Tuuk unraveled. He uses writings from different sources and archaeological findings to weave a detailed story of Norse presence in what are nowadays the Netherlands and Belgium. Some background information about certain events is about as much history as I can ‘handle’, but 336 pages of historical details such as years, dates, names, lineage and the like is a bit too much for me. I guess this is a book for walking historical encyclopedia such as my father in law, but of course if you want a reference book about the age of the Viking raids, this is the one to get.